As we all know, life is like a roller coaster ride. Up and down. Naturally it is easier to handle when life is at a high you feel good, your surroundings are good, 'all is well within my soul'. But when the lows hit. Keeping in mind as best as we can, God's ways are not always our ways. He sees the BIG picture! Seeing what we consider failure from God's point of view carries a whole different perspective. I know I still fail (no pun intended) in this area. It is hard not to see it from man's perspective. But, through our failures, if we have the right mind set as God, we can learn from them and be strengthened. Be able to start over afresh. With the help of God's grace we can apply what we learned from our failures and move on. Be even better, stronger and even more courageous. That is what my recovery is all about. Could NOT do it without God there with me as I heal and learn from not only my past mistakes, but my deep hurts. The closer and intimate I become with God, the greater our relationship becomes. I need not chase carrots, to feel good. Awesome post sweetie. I love your new blog look. The title fooled me, but your message delivers. Thanks for the reminder. 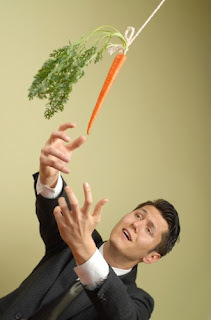 I need the carrot to be motivated. one day at a time. one step at a time....this post is awesome as you are. To have a close relationship with Him, is what I strive for. That's right - stick that joy thing in there! Bring it on! Hallelujah! What a great post and a true reminder! I always want to be chasing after God's carrots and you've captured the essence of our learning experience in going through the difficulties of life. It makes us realize we can't get through this life alone. We've always needed God. Everything will work out in the end....If it's not working out....it's not the end. God has a BIG plan for you! Wonderful post. Thank you. Yes, that is what recovery is about. And while I still have highs and lows, I find that, in recovery, the roller coaster is a little less extreme. not saying you are wrong, but give me a carrot...and i'm biting! :) in fact, if you know of any???? I would be totally crazy without Him right now. Wonderful post's you have and so real. I can not and will not live my life without Him in every minute. My hubby and I become more devoted to Christ with each day. That is our constant hope and we strive for it to show in our actions. Thanks for reminding us all of the power in His spirit..
You sound so much stronger, wiser, better! It's no secret what God can do! Bless you, dear Real One! Hey...well said! I'm Sarah from Victoria, Australia..nice to meet you ~ :-)!